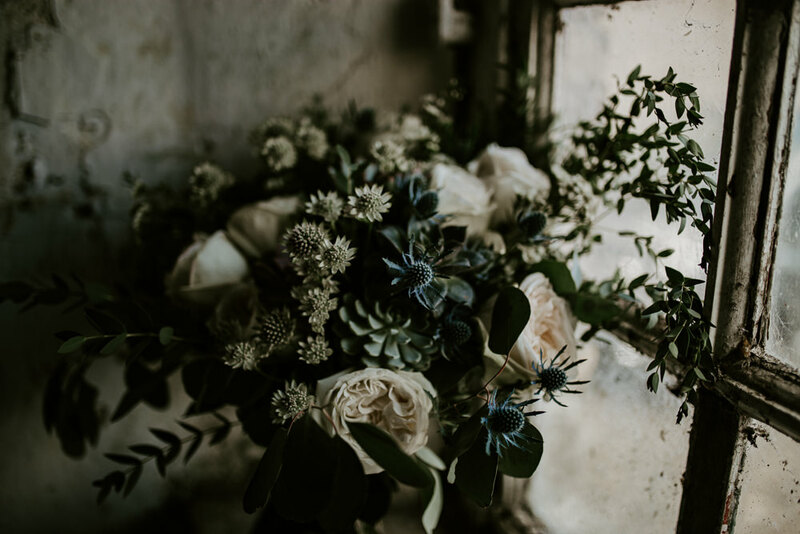 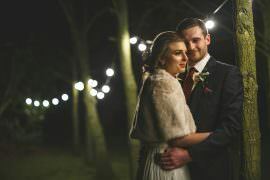 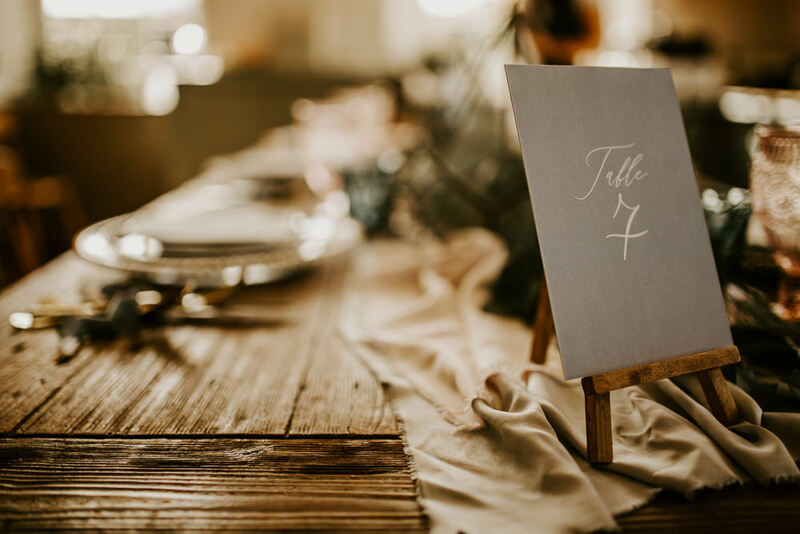 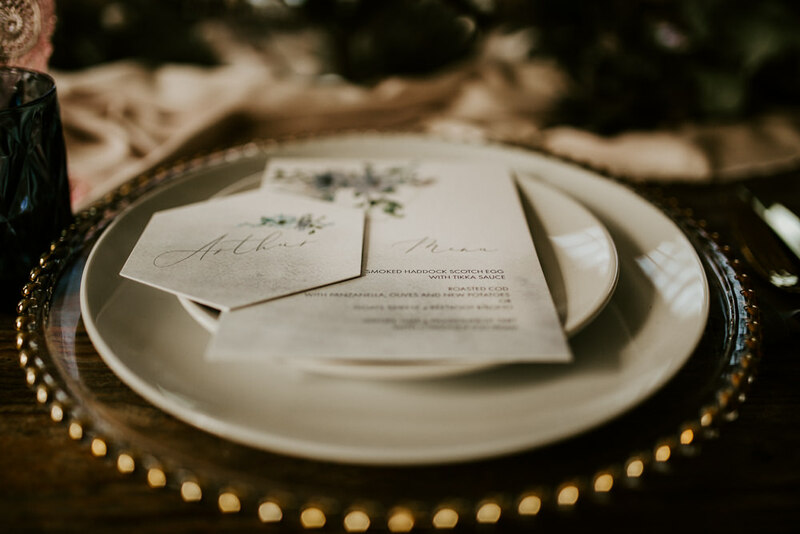 I just love the dark and cosy wedding ideas we have the pleasure of featuring today. 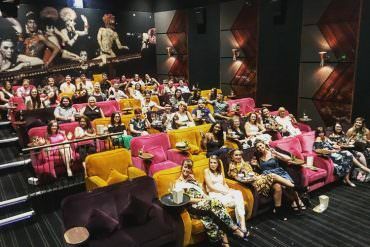 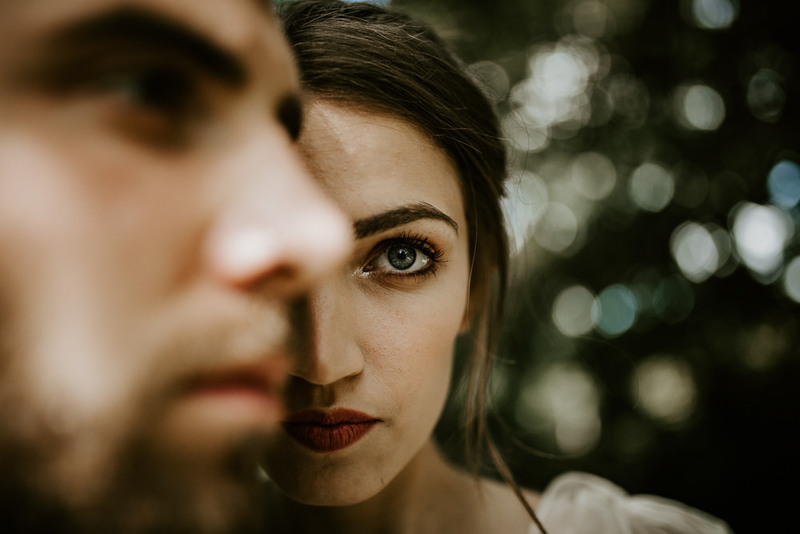 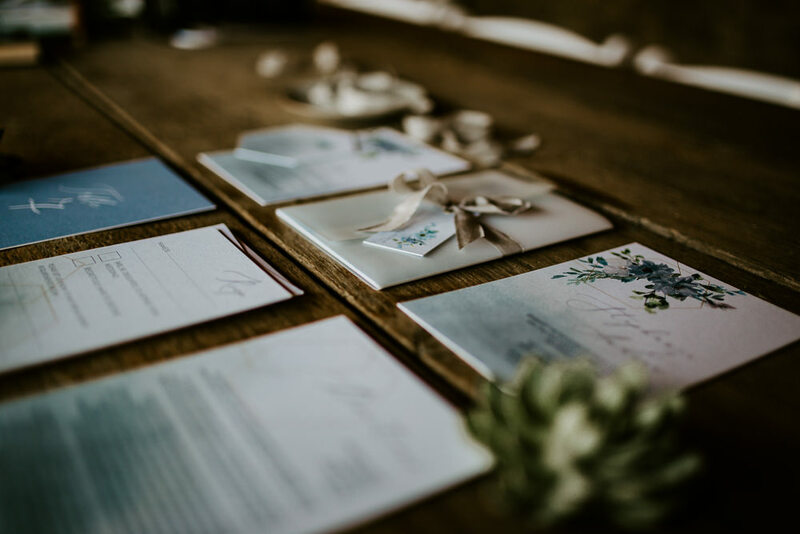 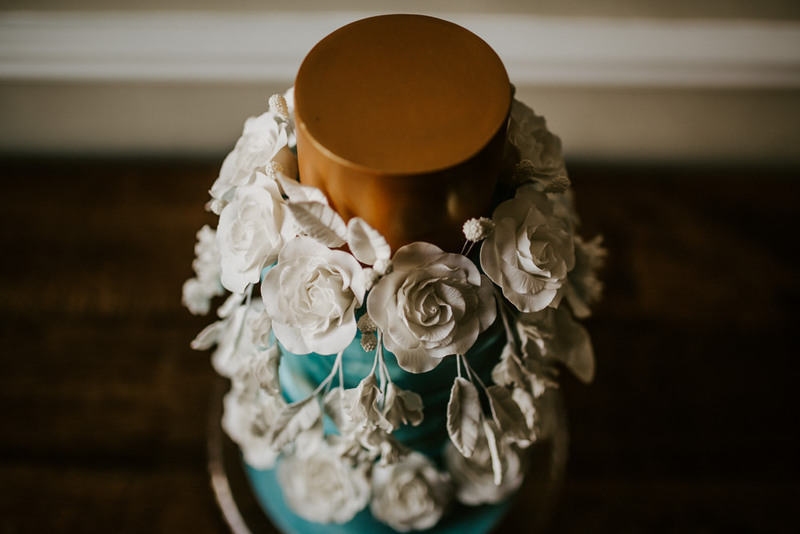 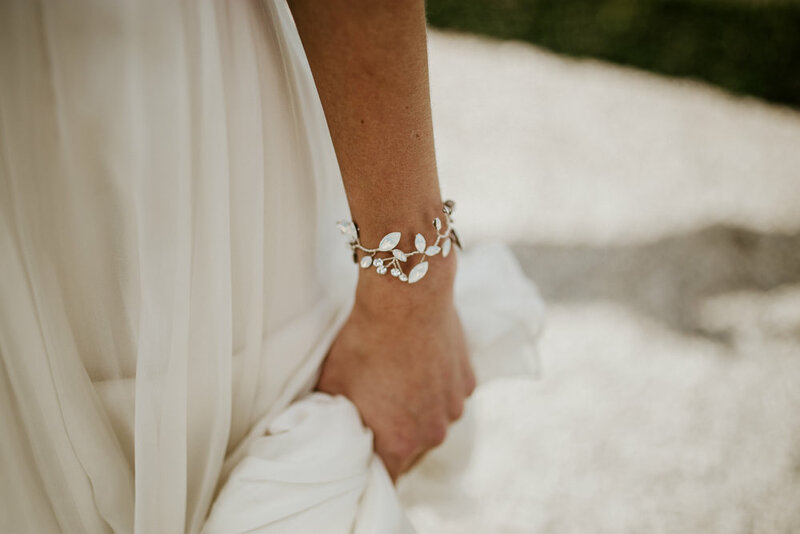 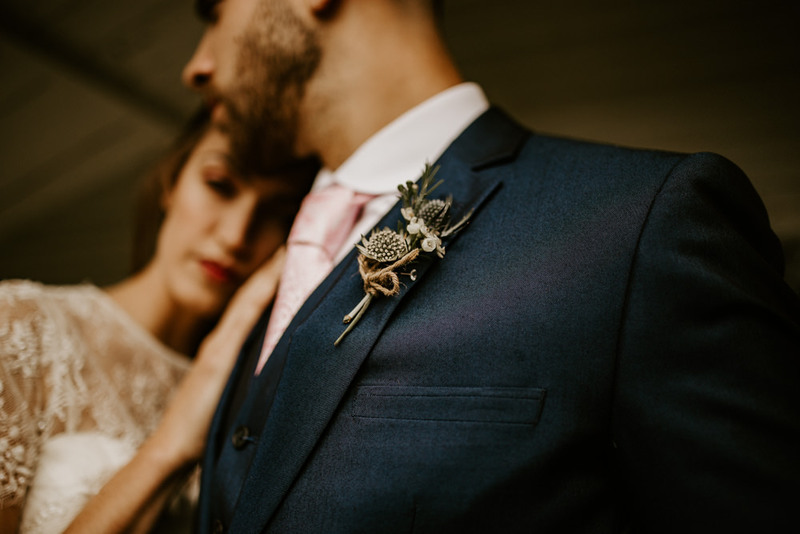 Organised and photographed by both Daze of Glory Photography and Catherine Spiller Photography, you are in for a real treat today. 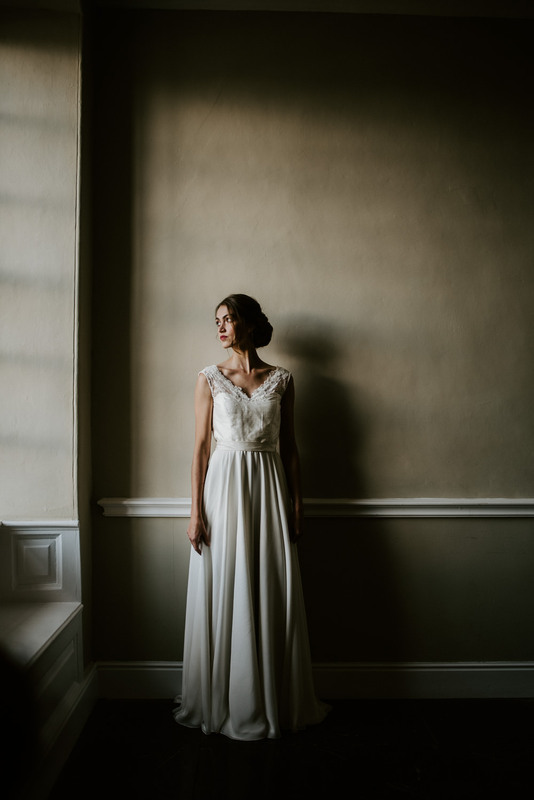 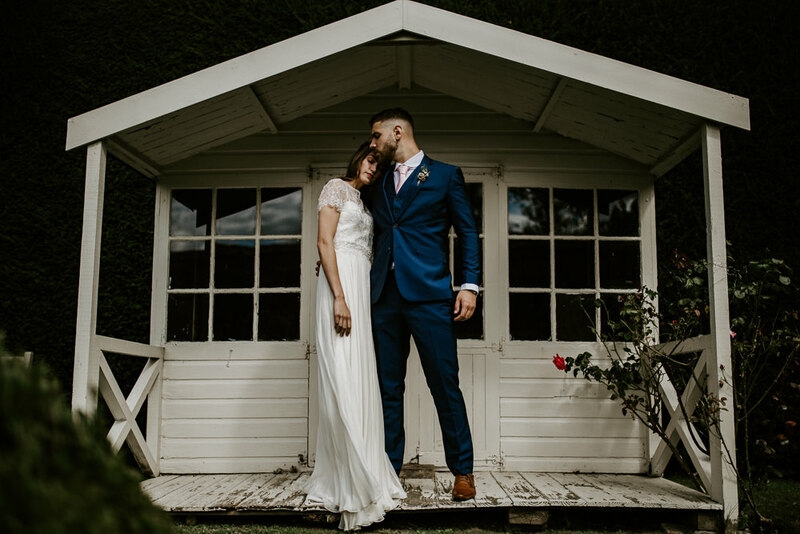 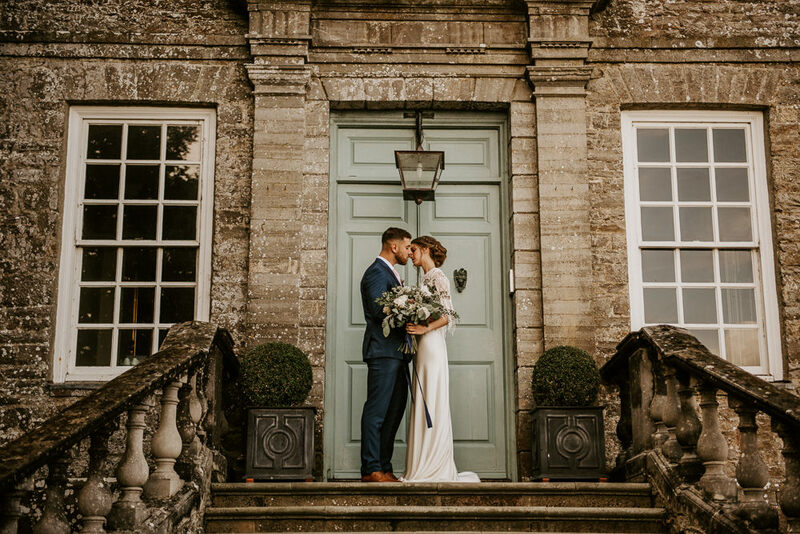 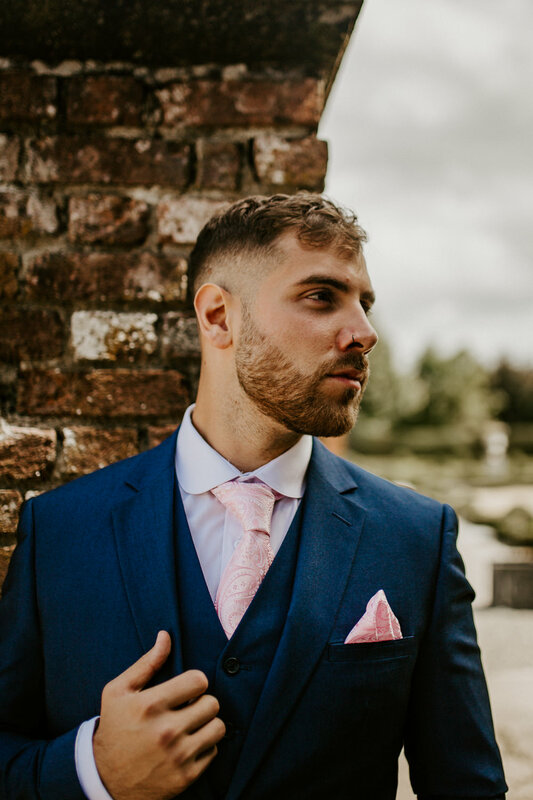 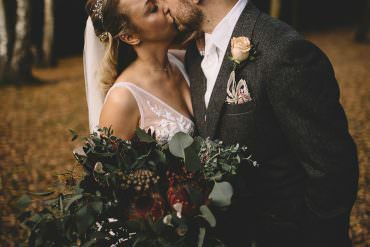 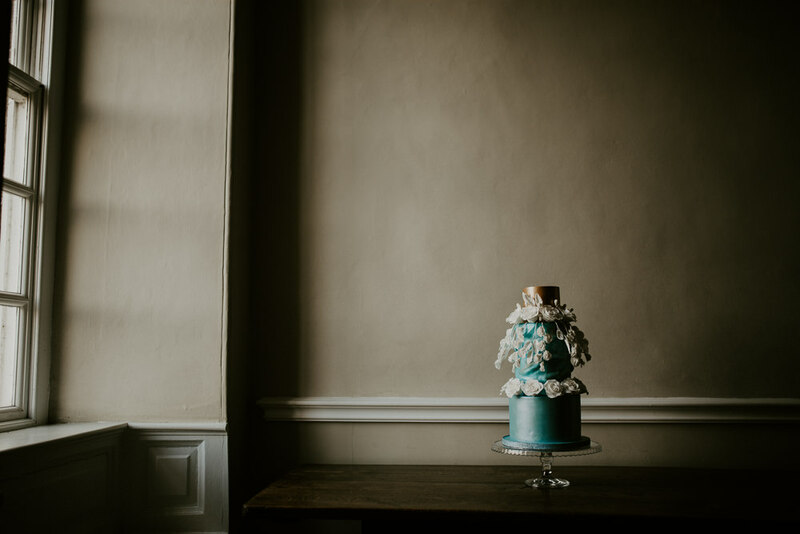 Set at Kingston Estate in Devon, this wedding editorial encompasses the setting beautifully, while also telling the couple’s story. 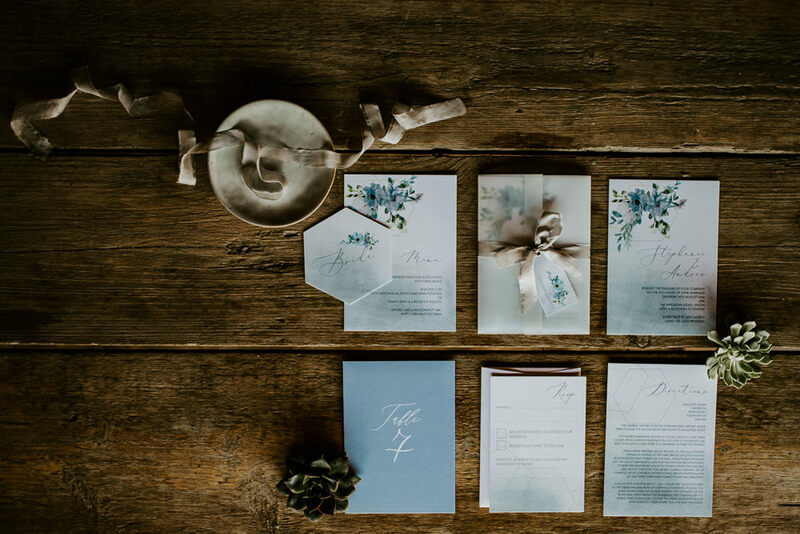 Using a myriad of deep blue tones, against soft colours and touches of gold, a unique and delicate colour palette was born. 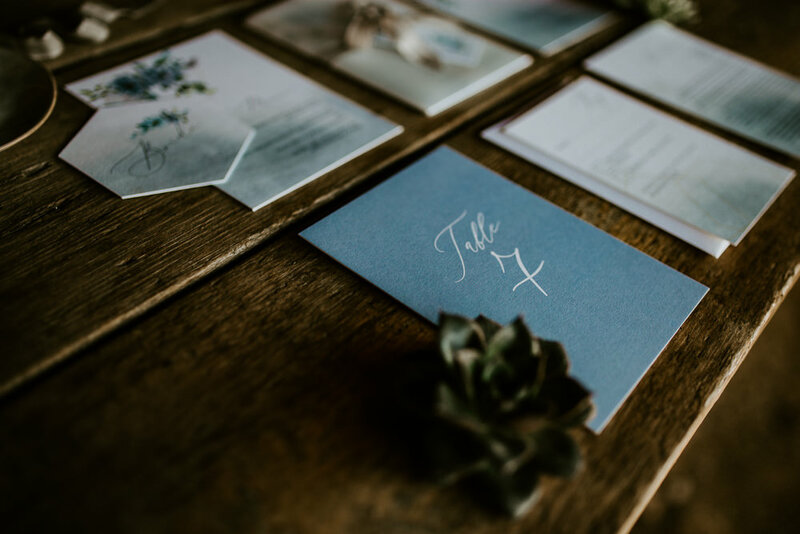 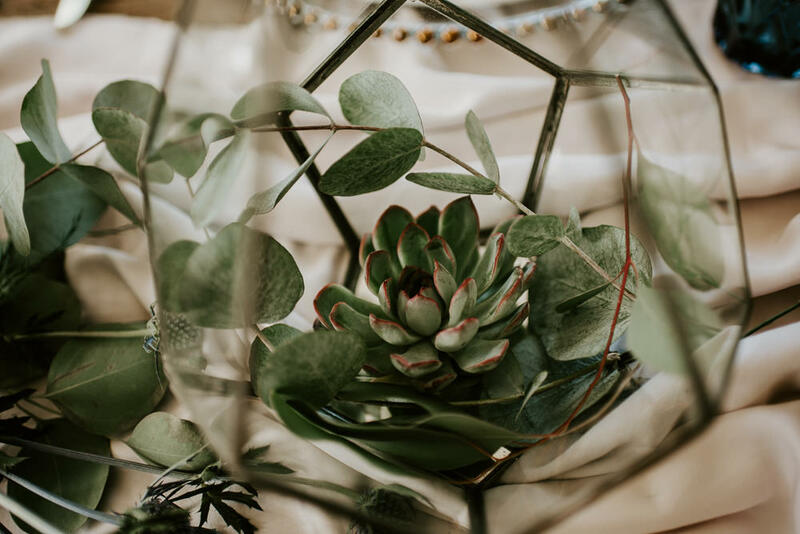 There was an elegant cake, an exquisite stationery suite and a tablescape featuring draping silks, gold cutlery and terrariums filled with succulents. 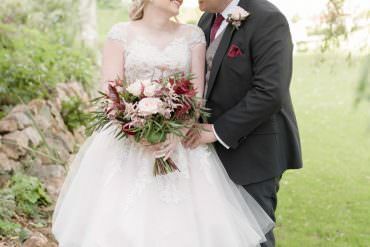 The bouquet was a beautiful example of wild florals, which included thistles, roses and abundant greenery. 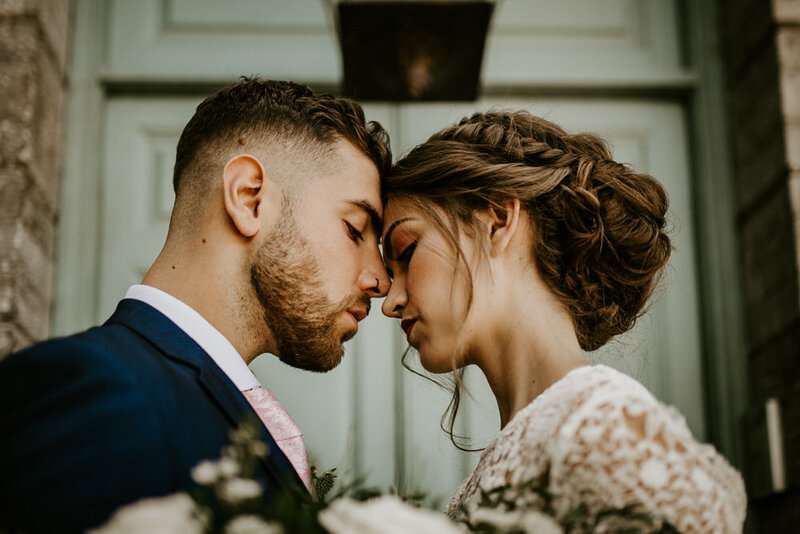 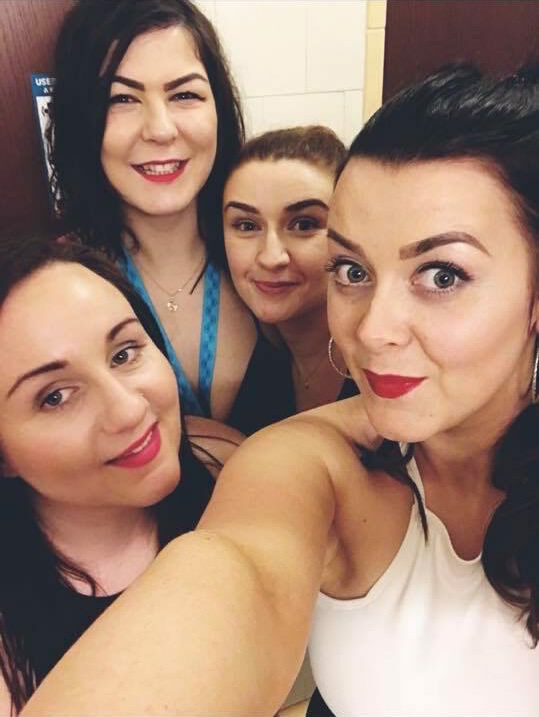 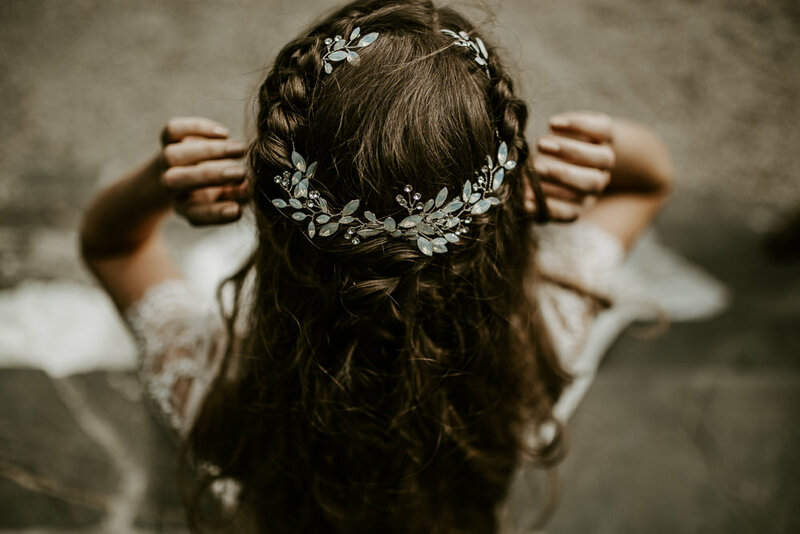 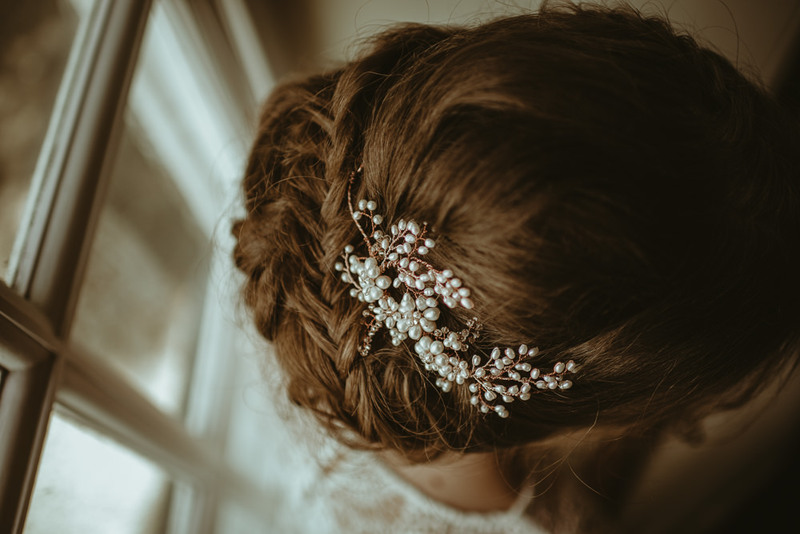 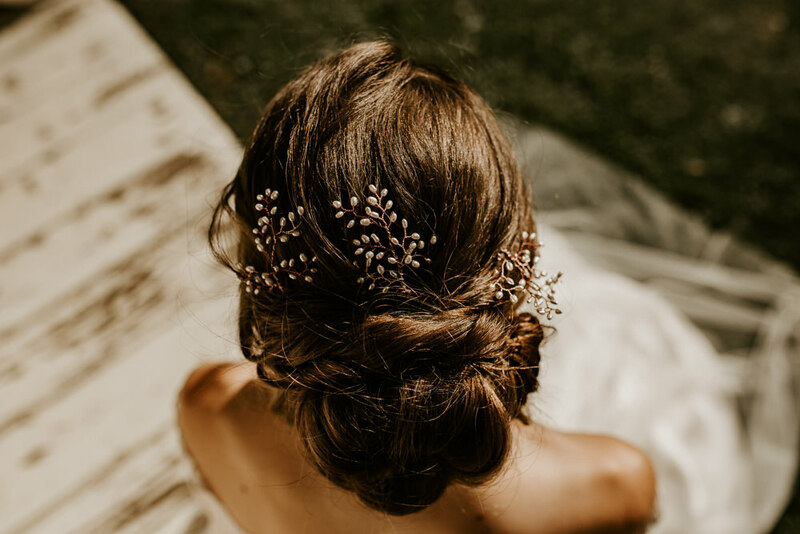 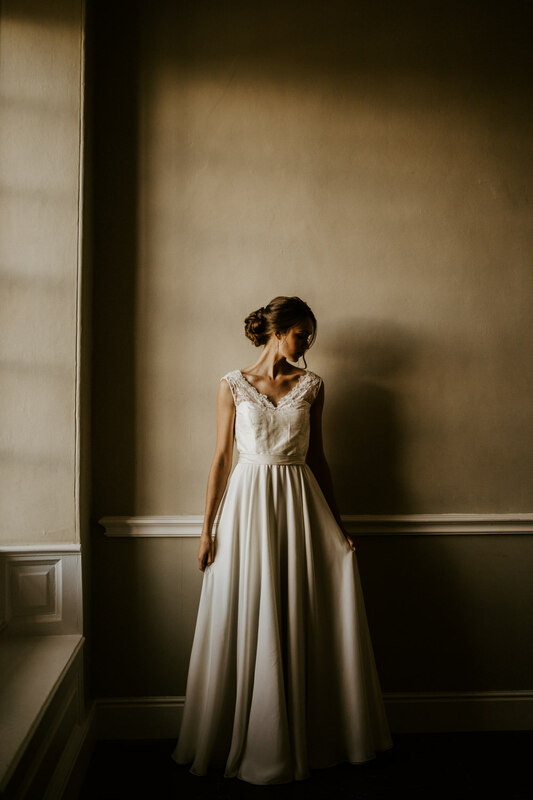 It worked beautifully with the elegant bride in an array of stylish and fluid gowns, teamed with the prettiest hair styles ever and flawless make up. 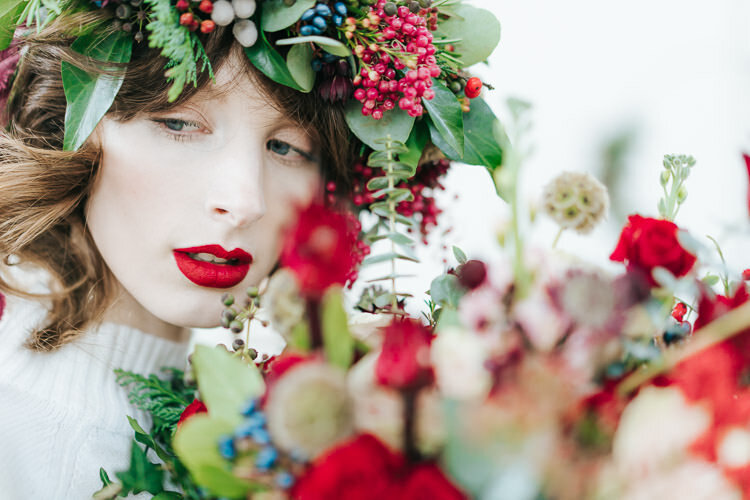 Soak up all the loveliness and be left feeling super inspired. 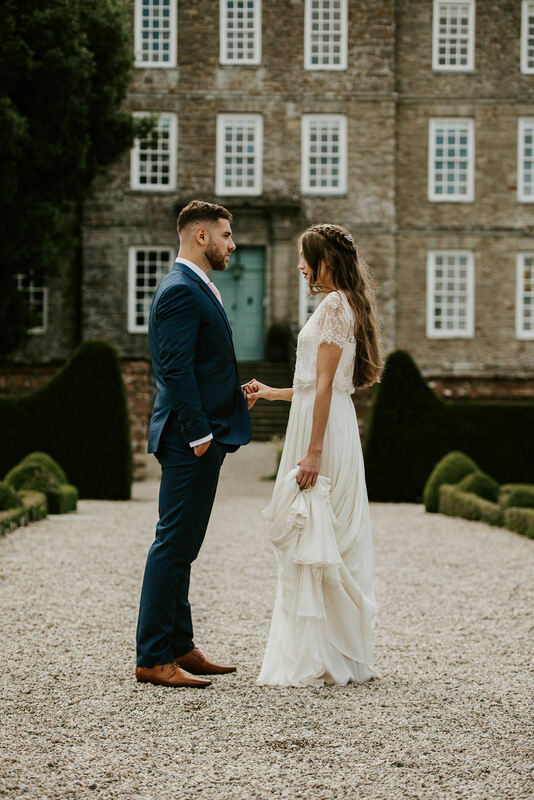 Kingston Estate, a Georgian mansion in Totnes, South Devon was an obvious choice for our shoot. 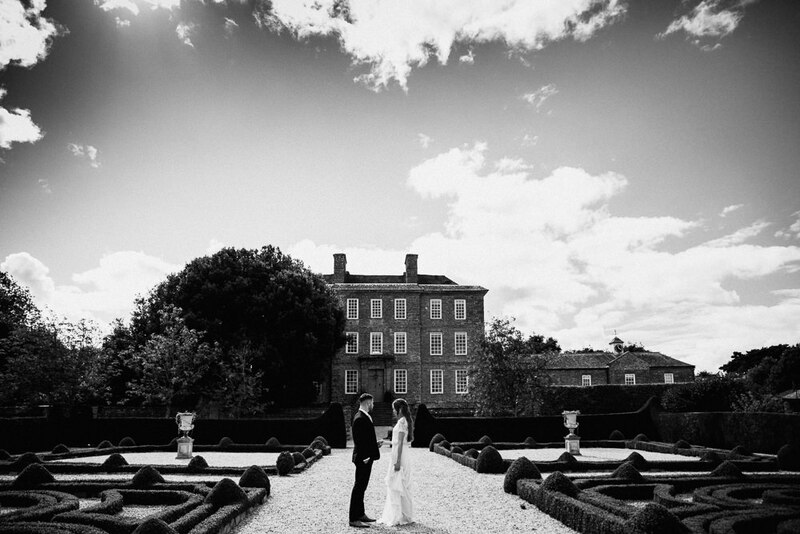 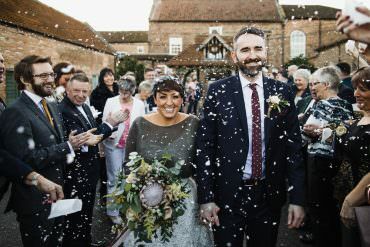 Set amongst miles of country side and winding lanes, this staggering venue is a retreat of absolute escapism. 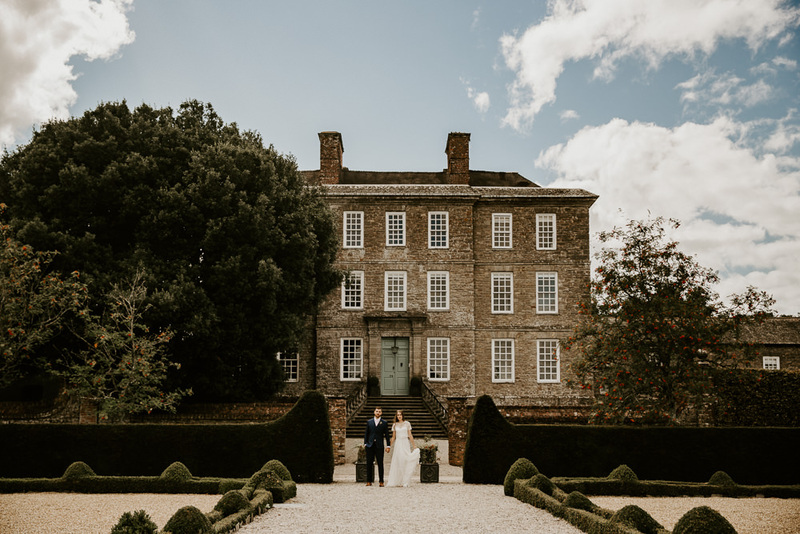 The symmetry within the grand architecture, walled gardens and an impressive maze is paired with elegantly aged and worn stone work and rugged story-telling historic features. 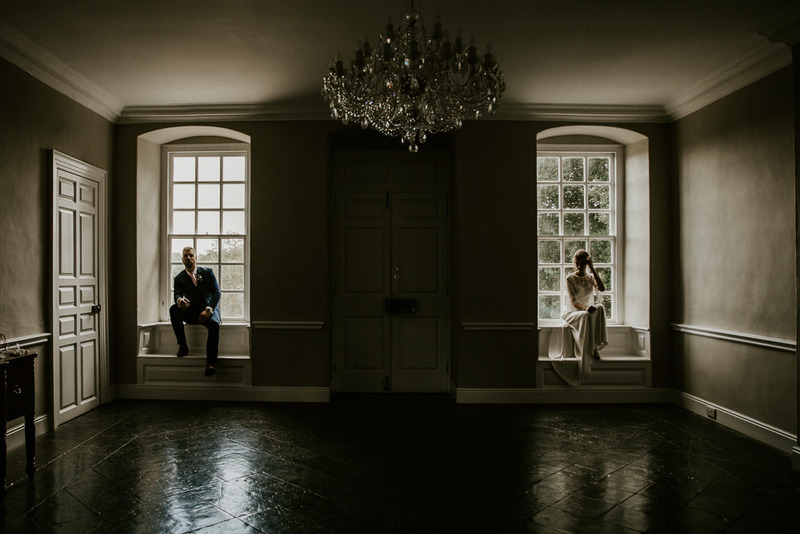 We wanted to push the boundaries of classic styling alongside the grandeur of the house and grounds while using natural light to evoke emotion and create pattern. 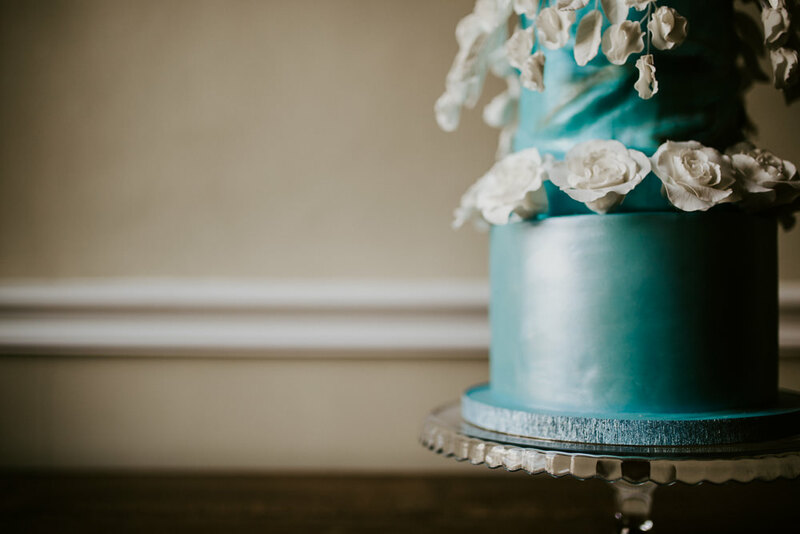 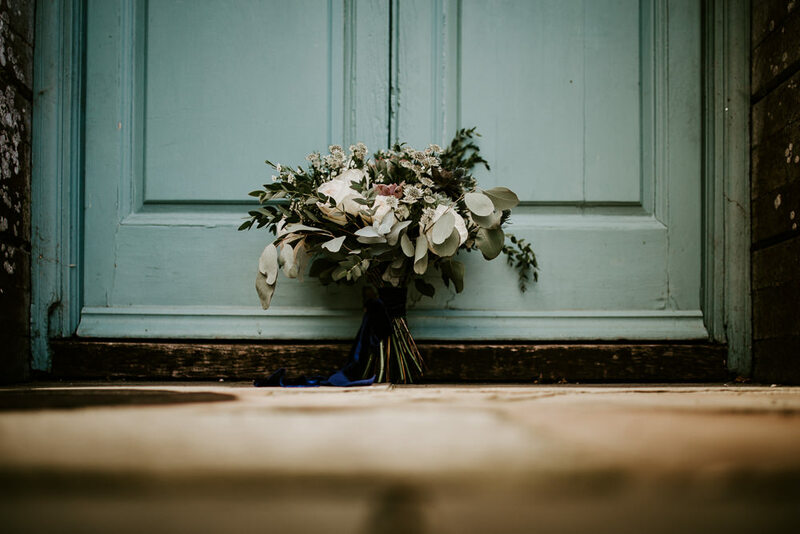 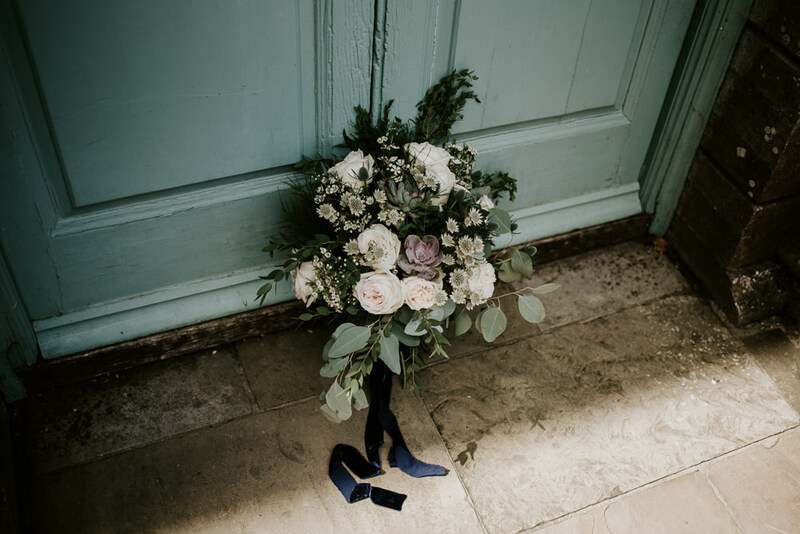 Blue was the colour that was delicately teased through our shoot without becoming overpowering. 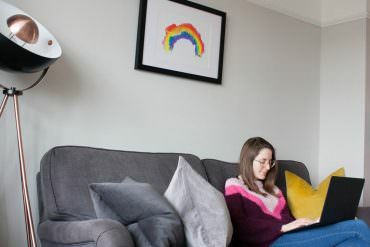 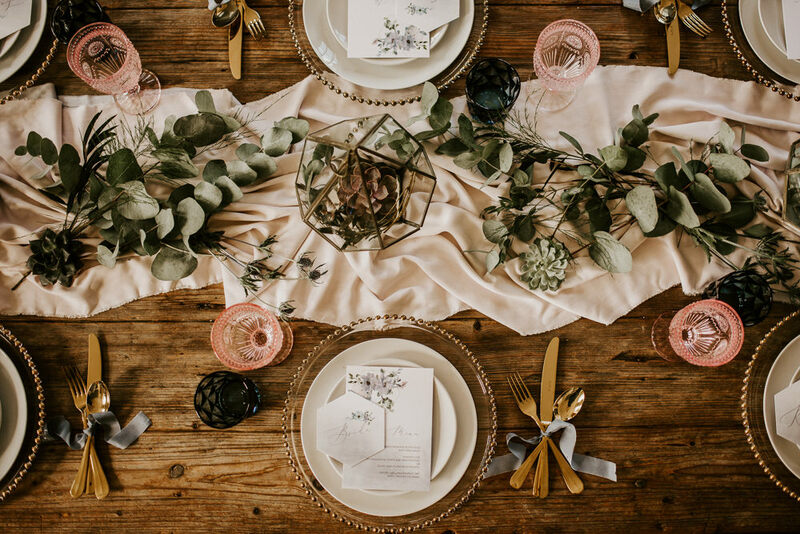 The age-old idea of a ‘colour scheme’ can threaten to become overpowering and dominate a wedding. 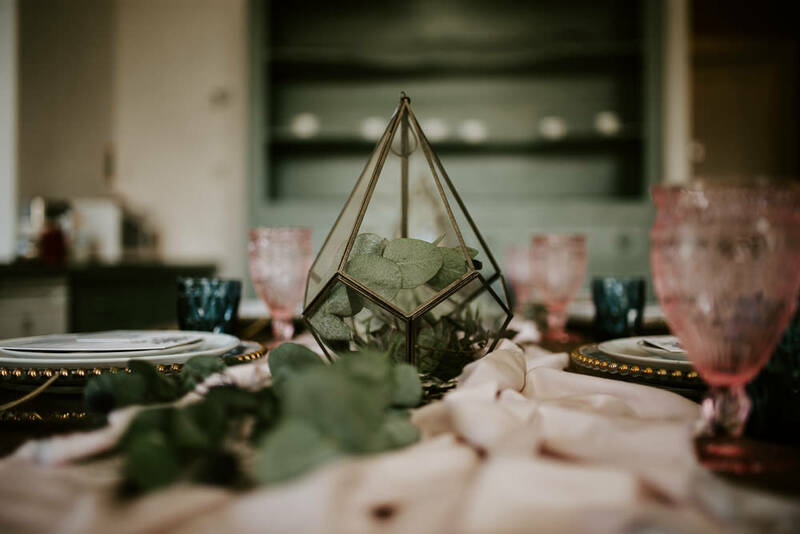 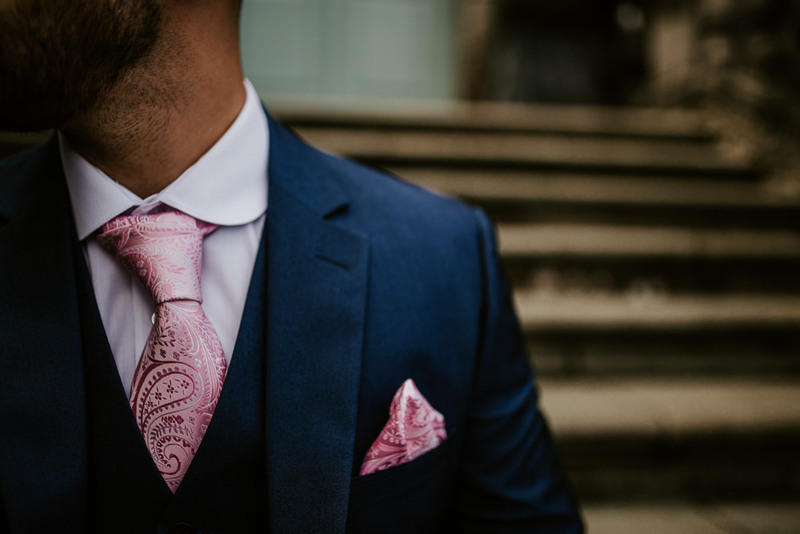 We aimed to create a setting where a colour could be a consistent feature in many varying medias throughout the wedding without dominating and overpowering all of the delicate features. 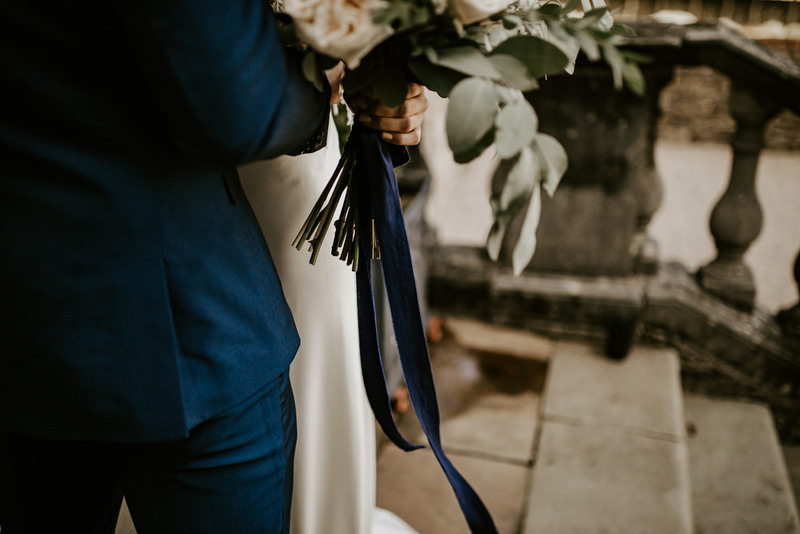 Mixing the blues in differing shades and textures with pastel tones and desaturated greens amongst the foliage, allowed for a culmination of both warmth and richness. 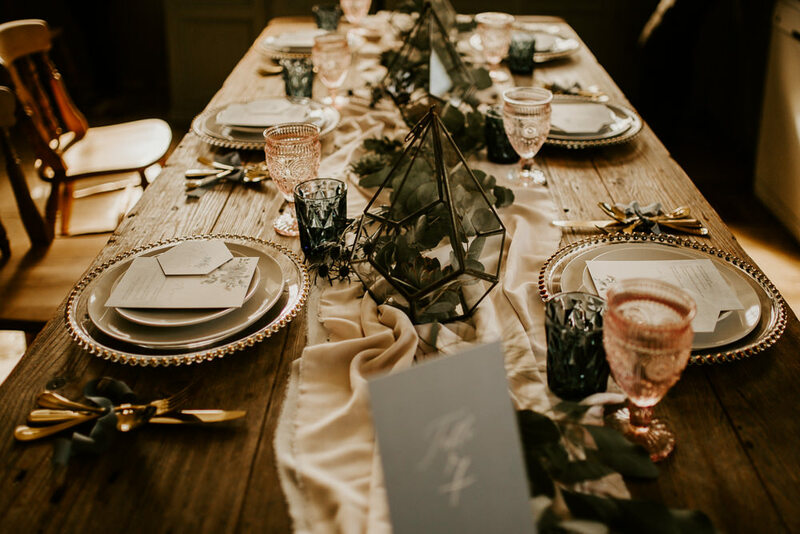 The idea of the use of ribbons was to create an air of movement within a setting, the images and across the venue. 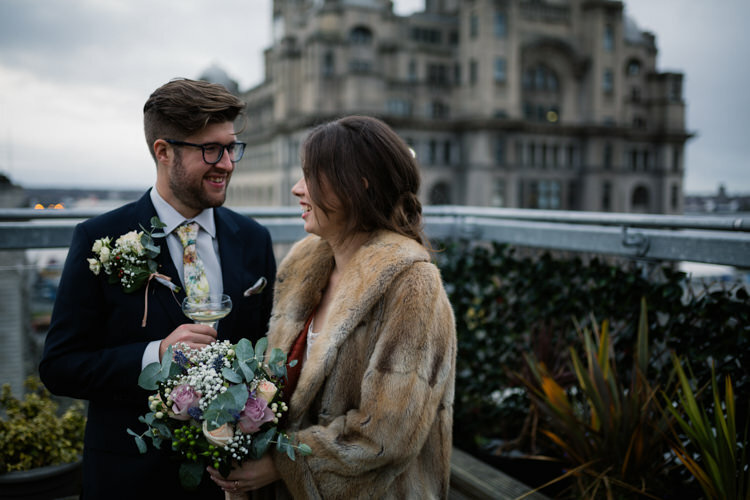 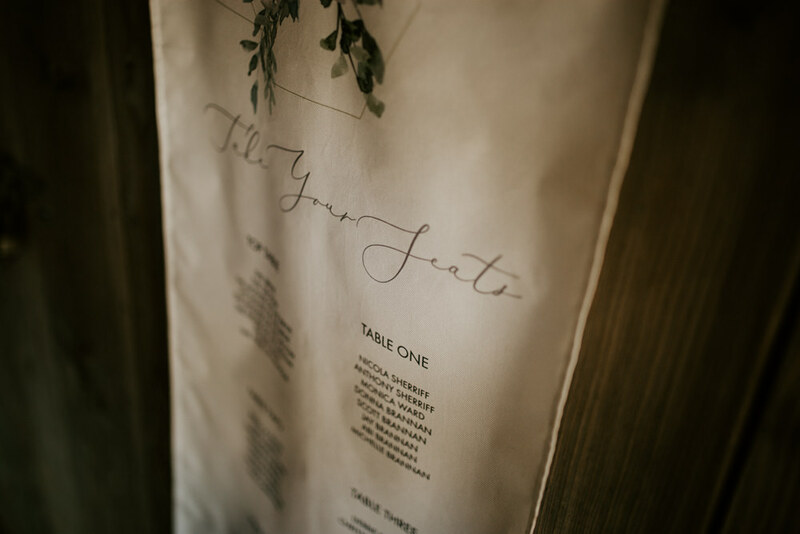 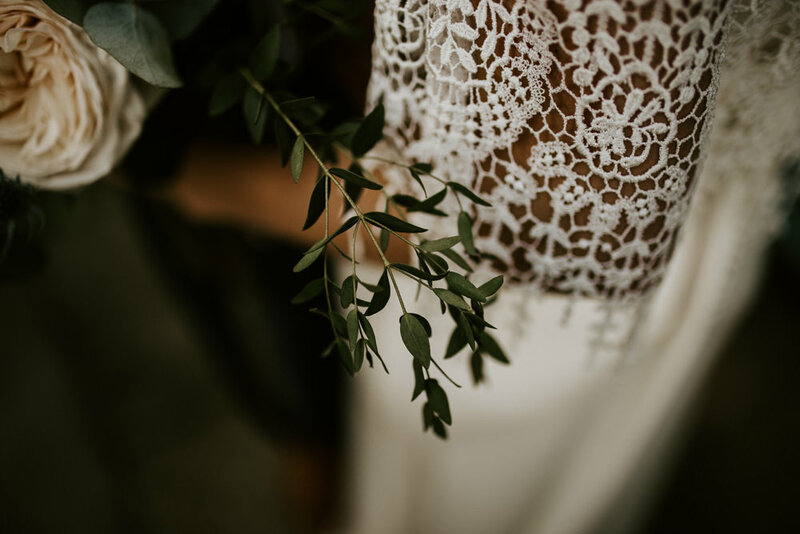 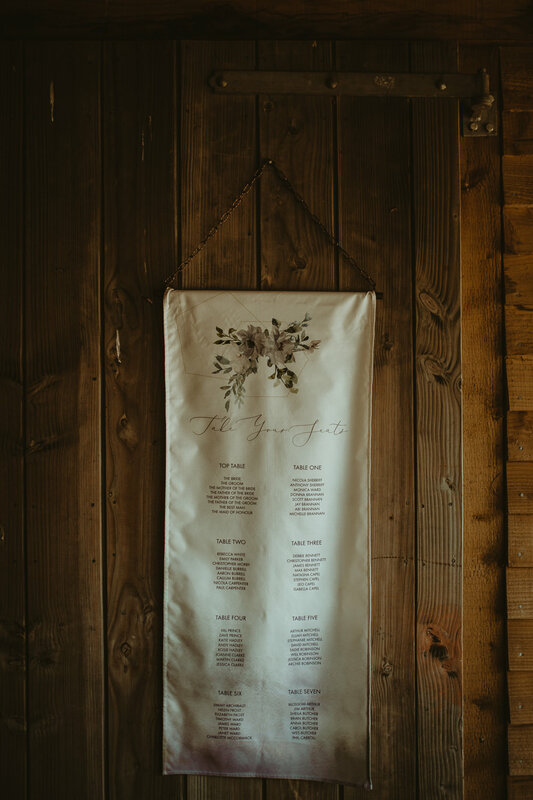 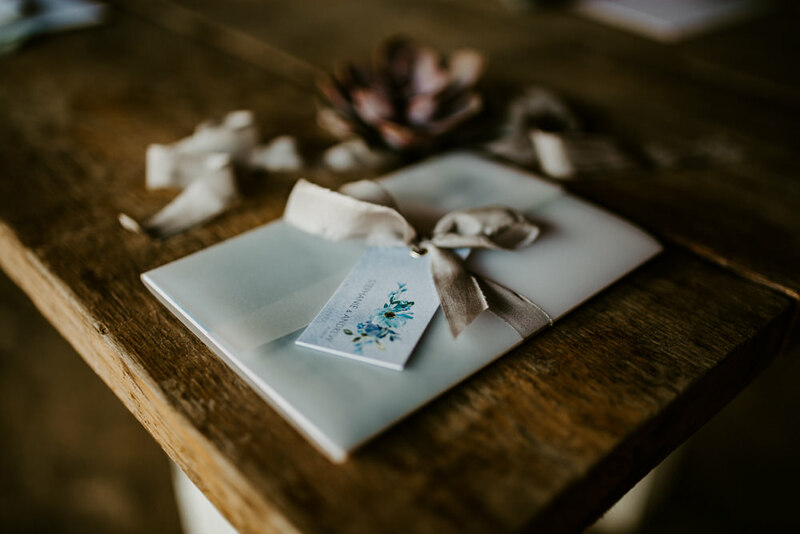 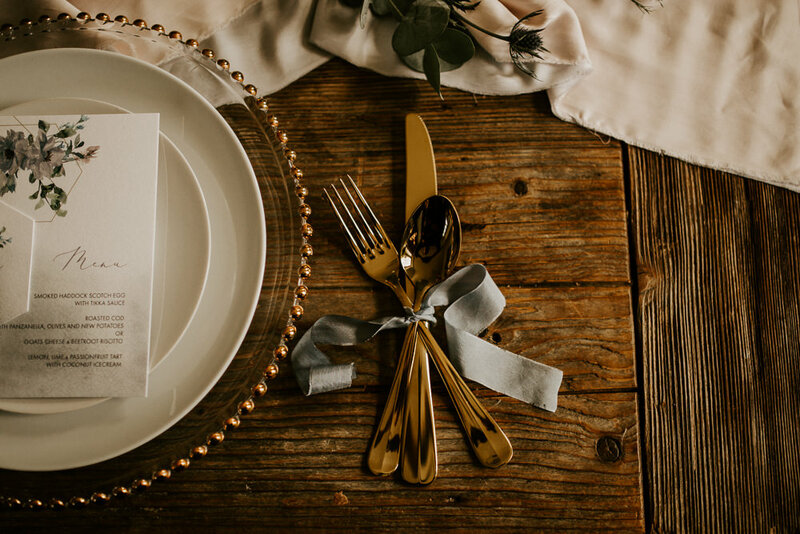 Whether that was hanging from a bouquet and dancing in the wind, or tied in a bow around cutlery at the table setting to softly make ripples in the fabric, we wanted it to reflect the atmosphere that we so often experience on wedding days. 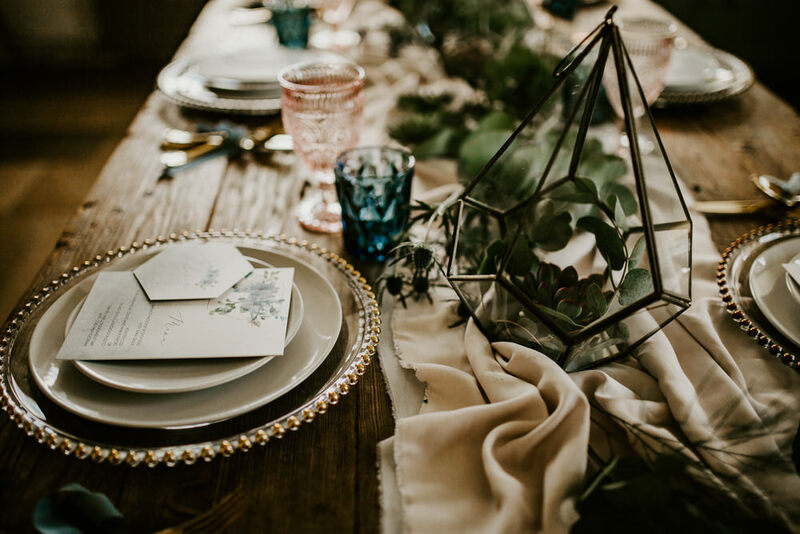 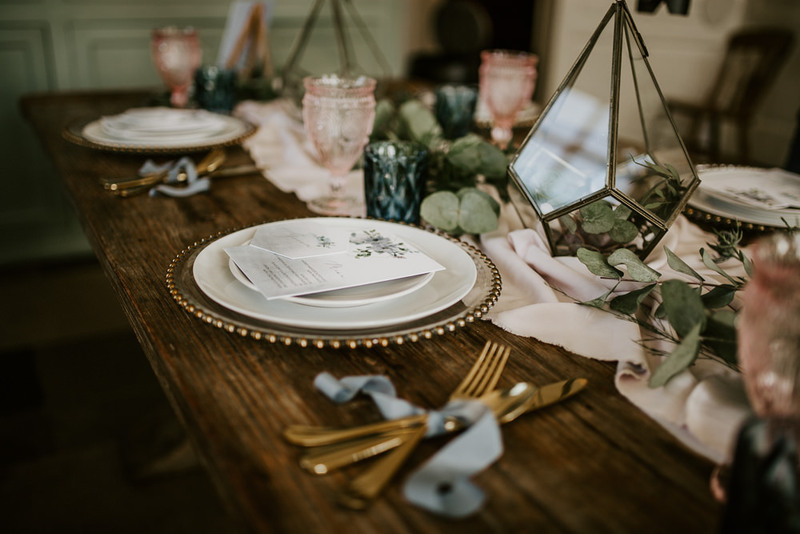 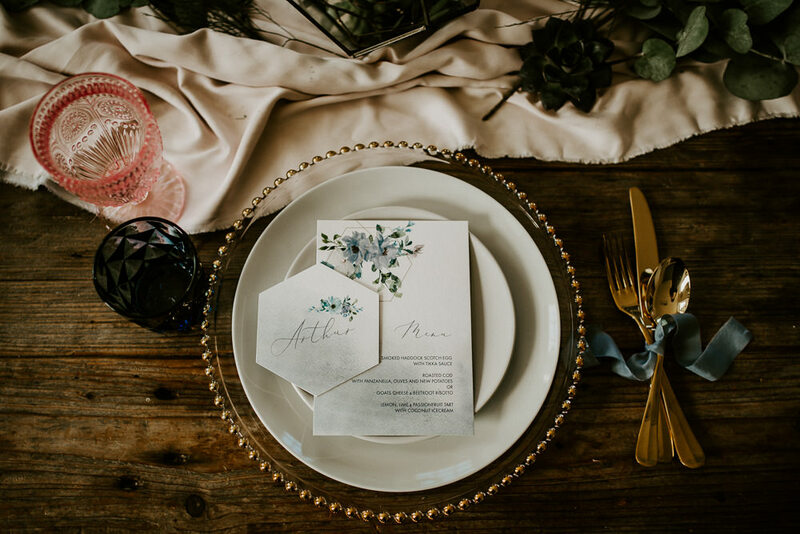 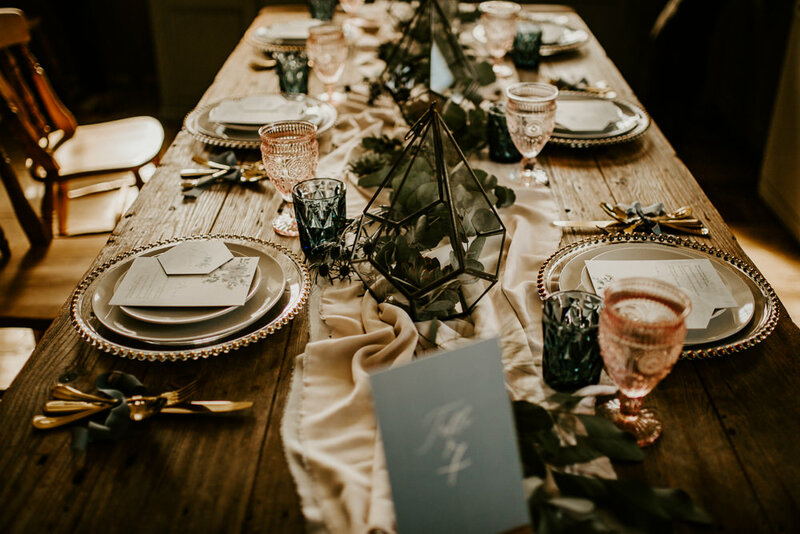 When the ribbon was used as part of the table settings, it mixed so well with the soft pastel florals, creamy ivory tones on dresses and the patterned glass against an aged wooden table, a true celebratory feast could be had. 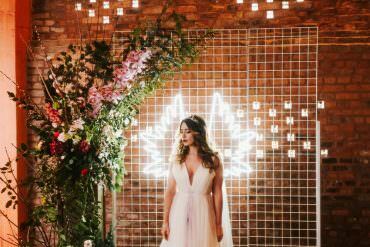 Our bride glowed elegance. 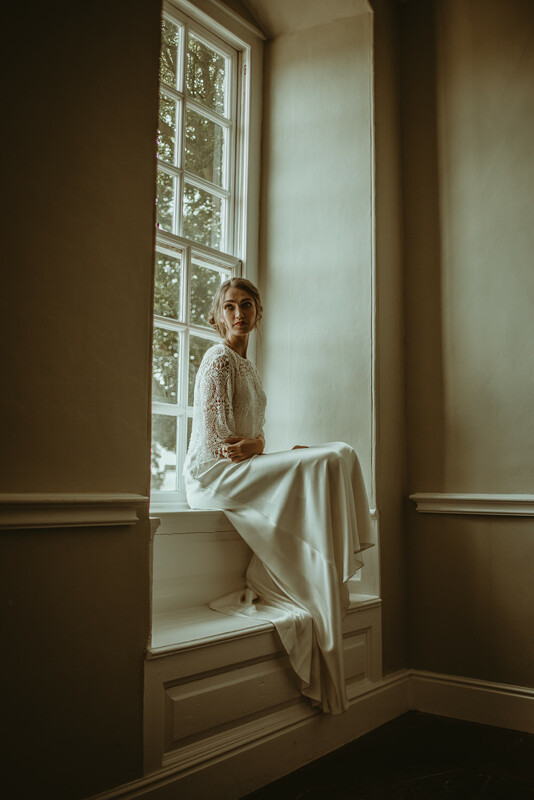 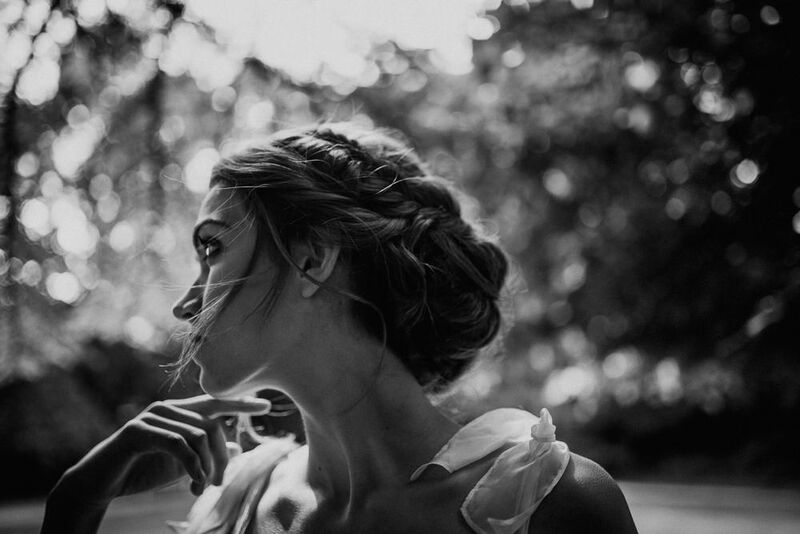 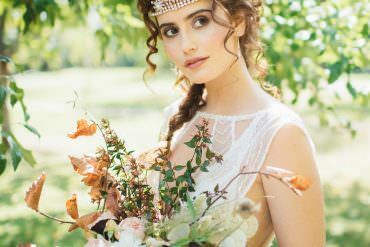 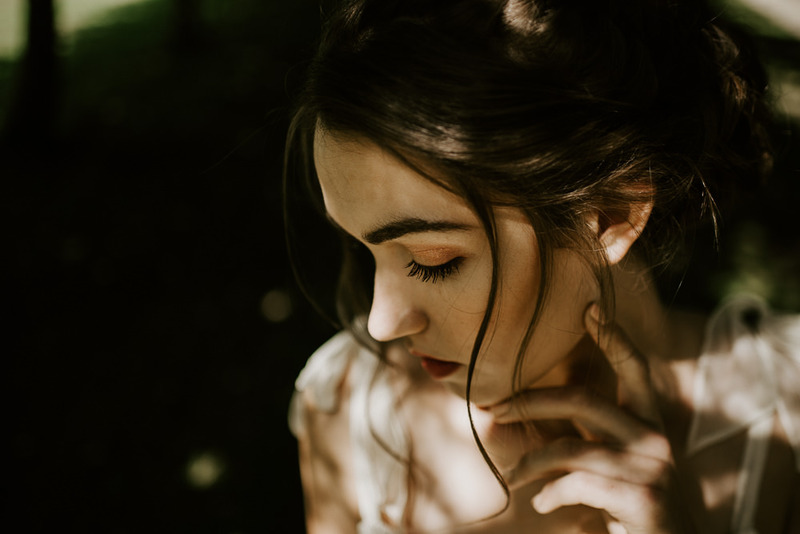 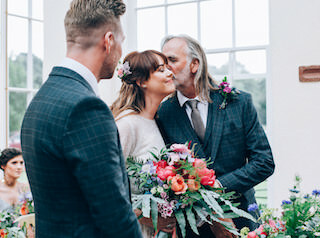 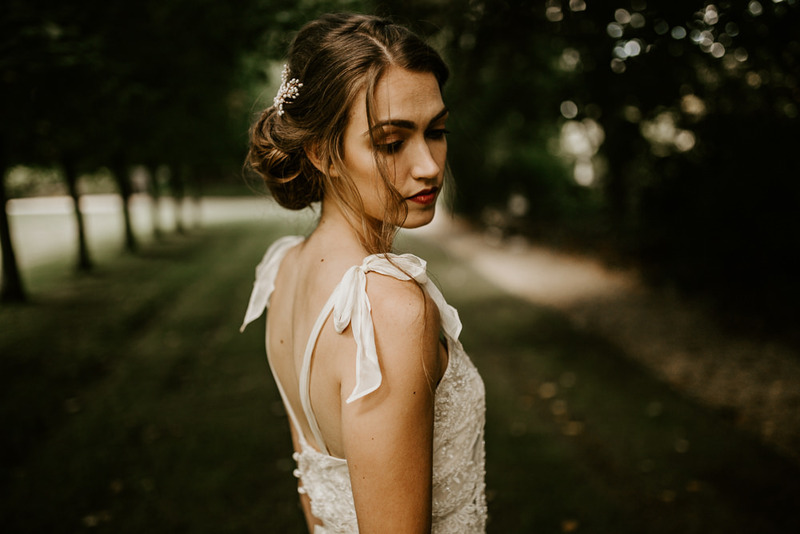 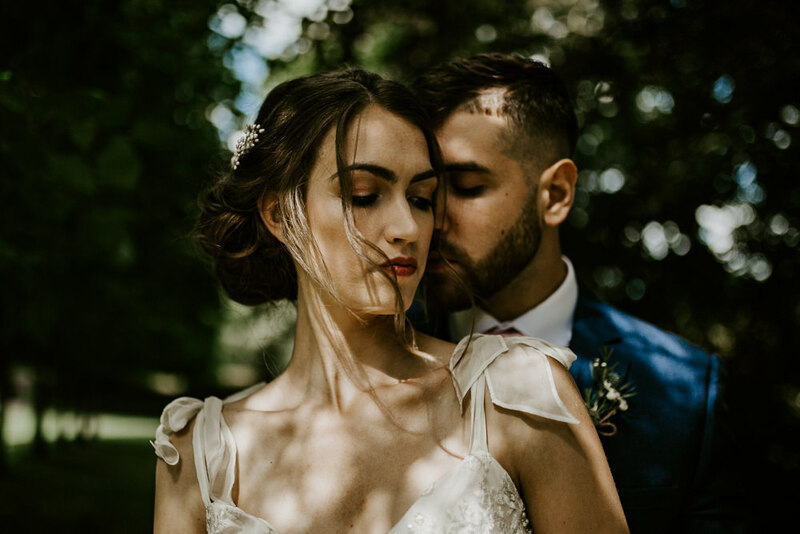 Her hair and make up were based on a classical English rose bride however we added a bold dash of the alternative bride who embraces texture and movement. 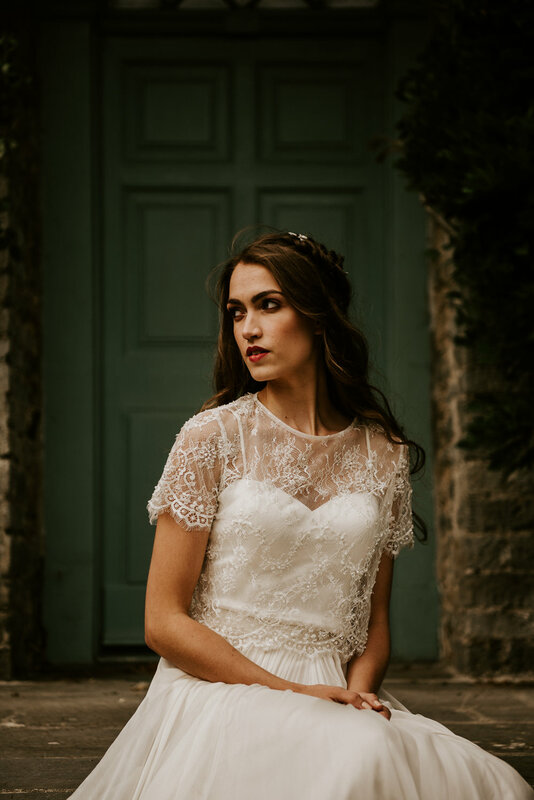 We loved the idea of detail, texture and movement for the wedding dresses. 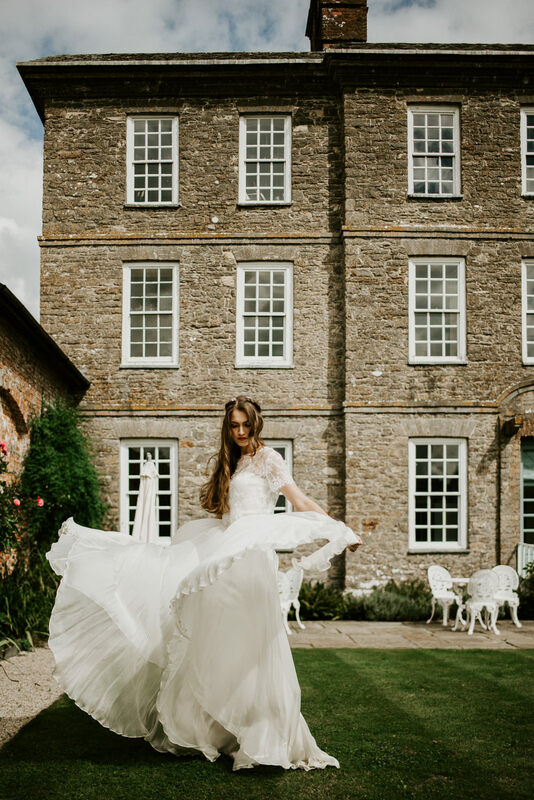 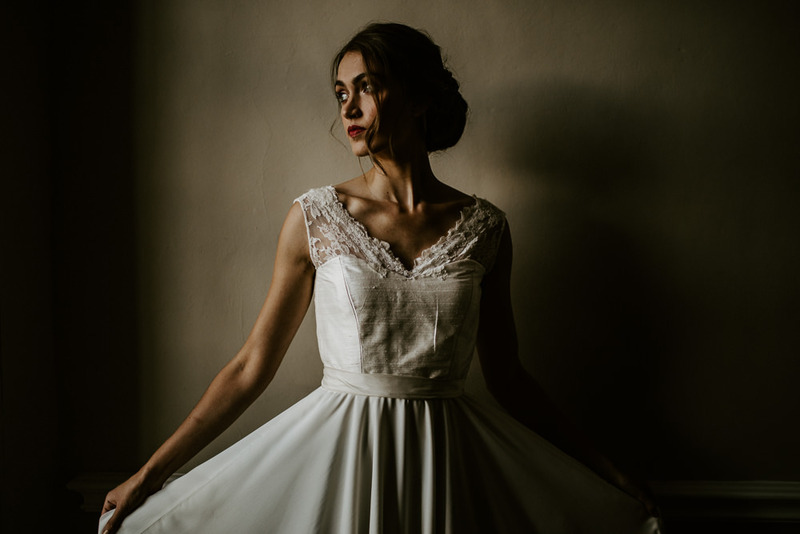 Dresses that dance in the wind, are timeless and traditional yet have an air of the here and now were key to the shoot. 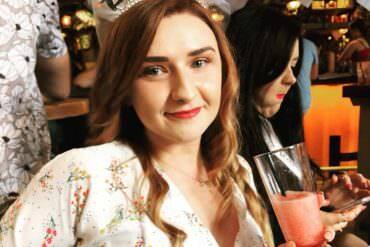 A true English Rose, she knows what she wants and the dresses show this off perfectly. 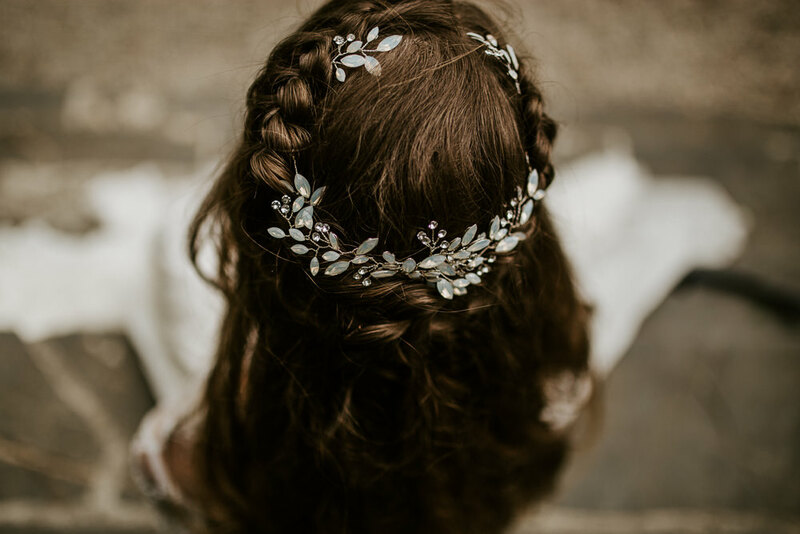 The jewellery and hairpieces were intricate and delicate yet stood out as statement pieces. 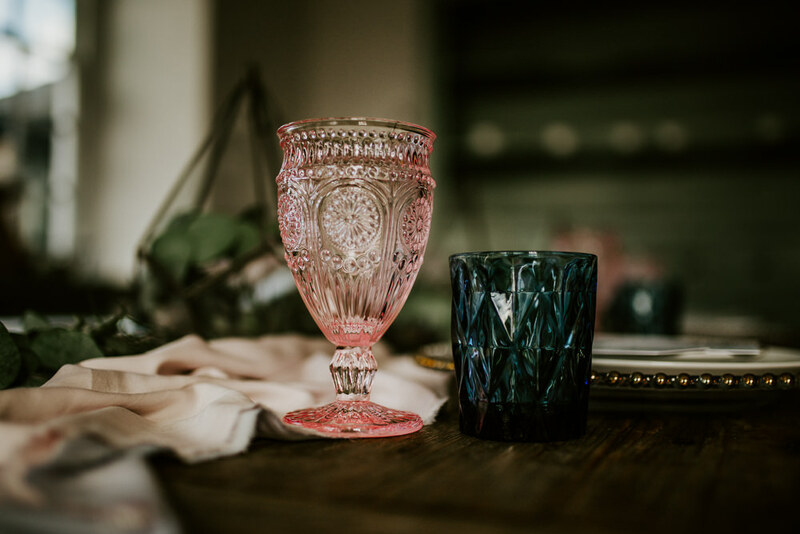 They therefore, fitted in perfectly with the theme of classic elements, yet bold in their own right. 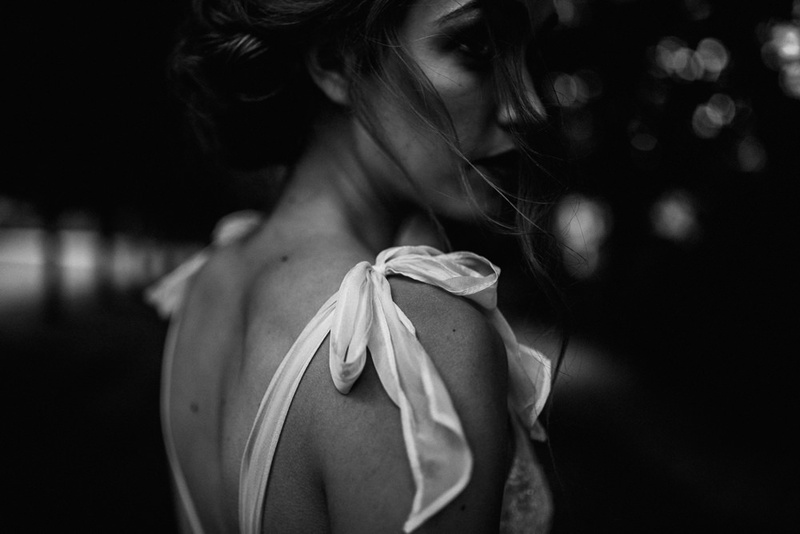 Our shoot says – this is who we are, this is what we do and we are now as one. 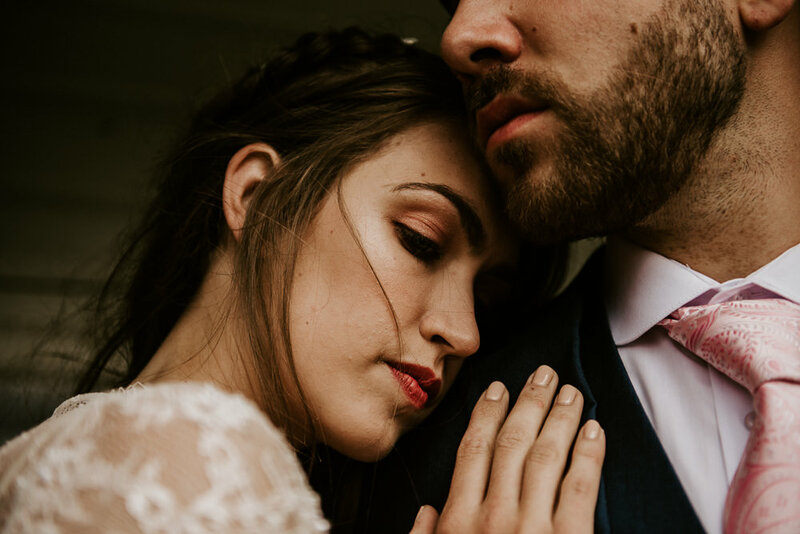 Something every wedding day should emanate.